This tufted, upholstered bed features a timeless style with a high headboard and low footboard. 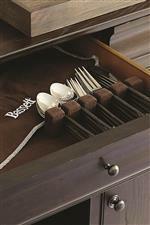 It's crafted from local wood with a finish that offers a look of unpretentious elegance. 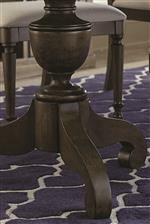 Tufting and nail head trim add flattering accents to the piece. This bed is just one item in a collection of bedroom pieces that draw their inspiration from the Louis Philippe, Directoire and French countryside styles. This panel bed is available in queen, king and California king sizes. The Provence King Upholstered Bed by Bassett at AHFA in the area. Product availability may vary. Contact us for the most current availability on this product. 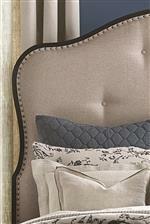 2779-H163 Upholstered Headboard King/California King 1 80" 5" 14"